Difficulty: Moderate to complex based on the computer case. Time Required: 30 minutes or more. Tools needed: Philips screwdriver and possibly a hex driver. This guide was developed to instruct users on the proper installation of a motherboard into a computer case. It includes step-by-step instructions for properly preparing the case, installing and connecting and necessary wires to the motherboard inside of the case. 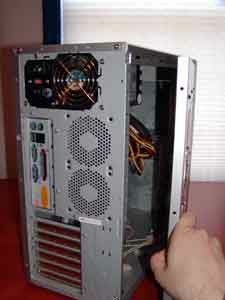 The guide is based upon a standard ATX board layout being installed into a mid-sized tower case. The case happens to have a removable motherboard tray to make it easier to photograph the necessary steps. The amount of time and ease of the motherboard installation will be very dependent upon the design of the case it is being installed into. All modern ATX motherboards have a variety of connectors and jumpers that must be set for proper operation of the computer system. The location and pin layout of these will vary from case and motherboards. It is recommended that you fully read and have available all motherboard and case instructions which should include pin and jumper layouts. The first step will be to open the case up. The method for opening the case will vary depending upon how the case was manufactured. Most new cases have either a side panel or door while older ones require the whole cover be removed. Remove any screws hold the cover to the case and set them aside in a safe place. Some cases have a removable motherboard tray that slides out of the case to make it easier to install a motherboard. If your case has such a tray, now is the time to remove it from the case. While there is a standard ATX connector design for the back of the motherboard, each manufacturer can layout the connectors however they need to. This means that the basic ATX connector face plate will need to be removed from the case and the custom one that ships with the motherboard be installed. To remove the basic ATX plate, gently press in on the corner of the installed ATX plate until it pops out. Repeat this on the opposite corner to fully remove the plate. Install the new ATX place by aligning the connectors properly (PS/2 keyboard and mouse should be on the side towards the power supply) and gently pressing from the inside until it snaps into place. There are a variety of sizes that a desktop motherboard can come in. In each case, there is a series of mounting holes that need to be lined up between the motherboard and the case or tray. Compare the motherboard to the tray that it is going to be installed in. Any location that has a mounting hole will require a standoff installed in the tray. Install the standoffs in the appropriate location. The standoffs may come in a variety of styles. The most common is the brass hex standoff that requires a hex driver to install. Others include a clip style that snaps into the tray. Lay the motherboard over the tray and align the board so all the standoffs are visible through the mounting holes. Starting with the centermost mounting point, insert the screws to fix the motherboard to the tray. After the center, work in a star pattern to affix the corners of the board. Locate the power, hard drive LED, reset and speaker connectors from the case. Using the manual from the motherboard, attach these connectors to the appropriate headers on the motherboard. Now the motherboard needs to be connected to the power supply. All motherboards will use the standard 20-pin ATX power connector block. Find this and plug it into the connector on the motherboard. Since most new computers require additional power, there may also be a 4-pin ATX12V power connector. If there is, locate this power cord and connect it into the connector on the motherboard as well. If the case uses a motherboard tray and the previously removed from the case, it is now time to slide the tray back into the case to finish off the rest of the installation. Many motherboards today have a variety of additional connectors for different types of ports that do not fit on the motherboards ATX connector plate. TO handle these, they supply additional headers that connect to the motherboard and reside in a card slot cover. Additionally, some of these connectors may reside on the case and can be connected into the motherboard. The installation of any header is very similar to that of installing a standard interface card. Once the header has been installed into a card slot, this and any case port connectors need to be attached to the motherboard. Please consult the motherboard manual for the appropriate location of the connectors on pin layouts on the motherboard for these cables. It is still necessary at this point to install the remaining adapter cards and drives to the motherboard in order to complete the system installation. It is important that once the system is up and running to verify that all the connectors, jumpers and switches are properly installed. If any of them are not work, power down the system and refer to the instruction manual to see if the connectors may be improperly installed.